My cat does lots of weird stuff. 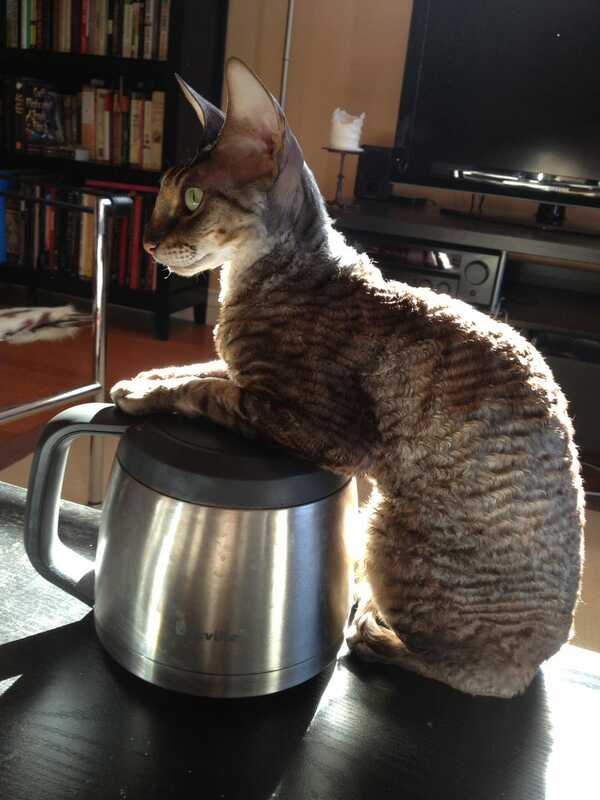 Here she is warming herself on the coffee pot. Last night she stole a French fry, with ketchup, dragged it under the couch, and ate it. She loves cake, cookies, scones, muffins, pastry. This can’t be normal. She has a mousey toy she carries from room to room with her, and brings to us in bed. For most laundry, we have tall, narrow, covered hampers. But that’s not a great situation for dirty towels or gym clothes, so for those we have a wide, open weave basket. My cat will pull out dirty towels and maniacally rub her head all over them. It reminds me of how some cats behave with a catnip pillow. She will not be deterred from towelie-ing. She will fight you if you try to take them away. If you cover them with something else, she will dig them out. I thought maybe she liked our shampoo, or the texture of towels, but lately she’s also been doing it with dirty gym clothes. It makes her smell pretty gross. And she gets SO MAD if you make her stop. What on earth is up with my bizarre cat? Does anyone else have a cat who towelies?